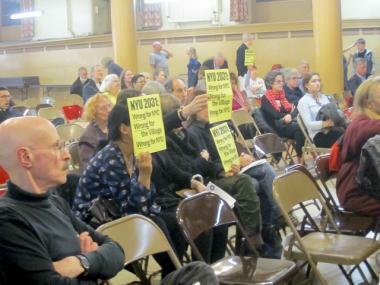 About 200 people attended CB2's Feb. 23, 2012 meeting, at the end of which it voted against NYU's 20-year expansion plan. SOHO — After weeks of public hearings and protests that have included everyone from professors to pooches, Greenwich Village's community board voted against NYU's proposed 20-year expansion plan Thursday night. In a unanimous vote, Community Board 2 passed a resolution recommending that the Department of City Planning deny NYU's application for rezoning that would allow the university to add more than 2 million square feet to the campus. "This community board is turning down flat the NYU proposal," David Gruber, co-chair of CB2's NYU working group, said before the board voted on the extensive, 23-page resolution at St. Anthony of Padua on Sullivan Street. The NYU 2031 plan calls for the creation of four new buildings on the two large blocks bordered by LaGuardia Place and Mercer, West Houston and West 3rd streets. 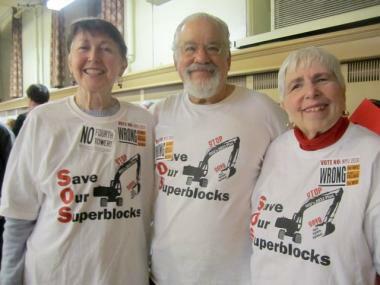 Washington Square Village residents Judy Magida, Milton Polsky and Judith Chazen Walsh attended the Feb. 23, 2012 meeting where Community Board 2 voted down NYU's 20-year expansion plan wearing shirts in opposition to the plan. "CB2, after extensive review and discussions with stakeholders throughout the area, strongly opposes the NYU 2031 plan," the advisory resolution reads. The plan would "forever change the character of this historic neighborhood, dramatically increase built-upon land at the expense of the light, air and recreation opportunities of existing open space," the resolution said, reducing residents' quality of life. Ronna Texidor, a longtime resident of Thompson Street, told the 200-person crowd that the expansion plan would make her neighborhood no longer feel like home. "You're not going to make a decision about our lives and our neighborhood and go on your merry way," the retired professional potter said. Though members of construction unions have repeatedly attended CB2 meetings in support of the job-creating effect of the NYU plan, no one spoke in favor of the university's plan Tuesday. NYU vice president Alicia Hurley, who did not attend the meeting, said in a statement that the university will review CB2's resolution and continue discussions with the community and city about their need for additional academic space. "NYU appreciates the community's feedback to date and believes that our five-year dialogue with our neighbors has already yielded tremendous results," she said. In the next phases of the city's public land use review process, NYU's rezoning application will be subject to an advisory vote by Manhattan Borough President Scott Stringer, followed by votes by the City Planning Commission and City Council.